Dr Tuppy Owen-Smith was one of the great allround sportsmen of the inter-war years, captaining England at rugby, representing South Africa at cricket as well as being a champion lightweight boxer. He arrived in England in 1929 with the South African cricket side and immediately won plaudits for his batting and fielding, finishing the summer by being named one of Wisden's Five Cricketers of the Year. 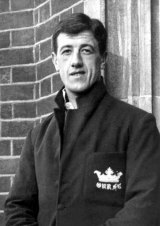 In 1930 Owen-Smith returned to England with a Rhodes Scholarship to study medicine at Oxford, and he won his Blue in both cricket and rugby ( and represented them at athletics and boxing as well) before going on to study medicine at St Mary's. An attacking fullback, he made his debut for England in 1933, making ten appearances in all. In 1937 he captained them in all three home international matches.